The 2017 WWE Hall of Fame class is shaping up to be a highly deserving group, as legendary figure Theodore Long is the latest inductee to be announced. Teddy Long’s name has been synonymous with being probably the most memorable SmackDown General Manager ever, but his career has spanned across many decades and many different roles. I personally remember seeing Teddy Long as a referee for the NWA back in the 80s; little did I think that 30 years later I would be writing about Long’s career as not only a referee for both NWA and WWE, but also a memorable ringside manager as well as a general manager that was involved in numerous memorable moments. If you remember the term “peanut head,” you probably remember Theodore Long becoming NWA’s “bad guy” ref who became manager for talents like The Skyscrapers, Norman the Lunatic, and Doom. Year later Long would become a less memorable “good guy” manager in WCW as well. During the mid-90s it seemed like Teddy was out of sight for a couple of years, and then popped up in referee stripes once again – this time in WWE. After a few years of refereeing, Long once again became a manager and was part of the memorable “White Boy Challenge” where he openly challenged “white boys” to take on Rodney Mack. Long also managed Jazz, Mark Henry, and others during this time. In 2004 Long became the general manager of Smackdown, and went on to hold that role off and on for many years after. Long was also briefly the general manager of WWE’s ECW before again returning to his role as Smackdown GM. 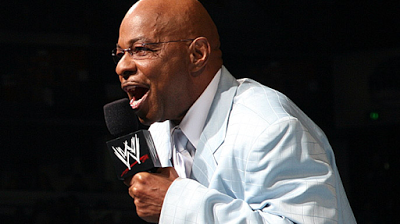 In recent years, it seems that Teddy Long has always been welcomed back to WWE for special appearances and is greeted by fans as a beloved figure in WWE history. Teddy has done it all throughout his career in pro wrestling and it’s great to see him take his rightful spot in the WWE Hall of Fame. Sting Makes First Ever WWE Appearance at San Diego Comic Con!